"Change the way you look at the world." Dr. Mark Powell is facing his toughest challenge in his psychiatric career. He is intrigued, yet perplexed by Prot, a man who claims to be from the planet K-PAX. Prot claims his planet lies 1,000 light years away from Earth, among the Lyra constellation. Even though the man known as Prot tells the tale of how he came to be on Earth, he is intelligent, beyond a common degree. Prot explains to the doctors of the Psychiatric Institute of Manhattan, that his travel to Earth was through “light travel.” He describes how he is allowed to take one earthling with him upon his return. The patients at the institute soon learn of K-PAX and how wonderful things are there. The majority of patients begin to ask Prot if they may be the lucky one to return with him. Prot has given a date of July 27 for a time when they will leave the planet Earth. Dr. Powell becomes frustrated with Prot and speaks to him about telling others they are leaving. Powell assumes July 27 is a date in Prot’s life that has been traumatic for him. He believes the date has stuck in Prot's mind due to the trauma surrounding it. Placing Prot under hypnosis, Powell finds that "Prot" may be short for Robert Porter. Porter had lost his wife and child in a horrible murder that happened in 1996. The film intimates that Prot may be an alter ego to release his tensions around the murder of his family. July 27 rolls around. Dr. Powell finds Prot underneath his bed in a catatonic state. Staff at the institute pull Prot out from under the bed and take him to the hospital where he can receive the care he needs. The patients of the psychiatric institute do not realize Prot is wheeled out of the building. One patient ends up disappearing. Her name is Bess and she is mute. Her home was destroyed in a fire years before and she has not uttered a word since. The staff at the institute never locates Bess. The stories Prot shares are so far out of the realm of believability that he is receiving the care the doctors feel he needs. Although the staff does not believe the stories, Dr. Powell feels an undeniable sense of “what if.” The movie ends with Prot describing how the people of K-PAX have found the universe will create a repeat of life until the lessons of that life are learned. This thought prompts Powell to reunite with his estranged adult son. 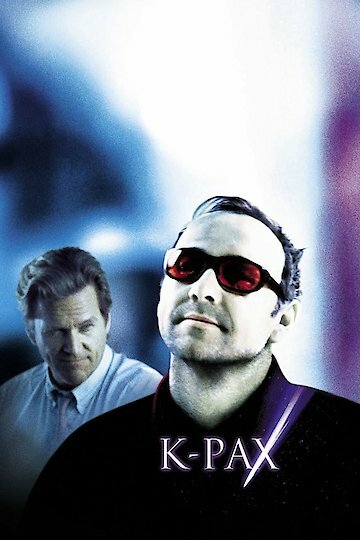 K-PAX is currently available to watch and stream, buy on demand at Amazon, Vudu, Google Play, iTunes, YouTube VOD online.